Midfielder, Gareth McGlynn is delighted to be back at Brandywell for a third spell. GARETH McGlynn intends to return to Derry City for a third stint next month with a ‘clean slate’ and a determination to prove he’s not a spent force in the League of Ireland. The 33 year-old midfielder, who will remain in New York City until January 29th, has a rich history with the Brandywell club having been involved in two FAI Cup wins and five League Cup victories during his two spells from 2001 and 2011 and, of course, that memorable UEFA Cup run in 2006. He left in 2011 at an uncertain time for the club, despite finishing the season in third place, as the departures of manager, Stephen Kenny to Shamrock Rovers, James McClean to Sunderland and Eamon Zayed to Persepolis in Iran came in the same year. However, the Inishowen lad doesn’t believe he has unfinished business or any regrets and expects to feel the same excitement he felt when first walking through the Lone Moor Road gates as a fresh faced teenager when he reports for duty on February 1st after a four year absence. “There’s no such thing as unfinished business for me,” he declared. “I’ve no regrets. I’m going back with a clean slate. I would imagine when I walk into Brandywell it will be like the first time, with the excitement and a little bit of nervousness. McGlynn will return as one of most senior members of Shiels’ side alongside his former teammate Gerard Doherty after agreeing on a one-year deal this week. Goalkeeper, Doherty is the only man remaining from the 2011 squad which featured the likes of McClean, Danny Lafferty, Kevin Deery, Barry Molloy, Stewart Greacen and Zayed - so it’s a very different team ahead of the 2016 campaign. “It will be strange going in as one of the oldest at the club but I’m nearly sure Gerard Doherty is at least 38!” he laughed. “It will be interesting and I’m looking forward to working with Kenny, Donal O’Brien and the rest of the backroom staff. “I’m hoping we can start well and get a bit of momentum and positivity and get a few people back to Brandywell - that would be the main thing for me. “I’m not oblivious to the challenges ahead but I’m looking forward to taking it on. This will be a tough year but Kenny’s the right man for the job. 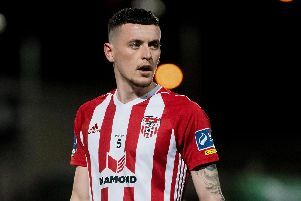 The midfielder revealed that his wife Ciara’s pregnancy dictated an early return home to Ireland and while he had contacted several League of Ireland clubs to alert them of his availability, a return to Derry City made perfect sense following two years in Australia followed by two fruitful years in the USA. “I’ve lived for two years here in New York and I would have liked to stay for another couple of years and then headed home but obviously with the wife being pregnant and due in April, it’s forced our hand,” he revealed. “When I knew I was going home I had four or five clubs in my mind that I was going to contact and see what developed. And McGlynn has no fears about fitting back into League of Ireland football. He played for Stirling Lions in Perth alongside former Middlesbrough and Drogheda United defender, Jason Gavin and played at a similar standard with Bronx-based club, Lansdowne Boys. “I left Derry in 2011 after probably one of my better years. I went out to Stirling Lions. The standard is probably mid-table in League of Ireland,” he explained. “We had Jason Gavin who played in League of Ireland for years and played 36 games for Middlesbrough in the Premiership. “We also had Andy Todd who used to play for Blackburn, so there was good foreign players and good local Australian U21 internationals. I was a senior player in that team and would see myself in a similar role for Derry. “When I went to Lansdowne Boys it the same situation. They had never won the league and the first year I arrived we won the league and then won back-to back titles. It was a good standard as well. Sean Kelly and Daryl Kavanagh who played in the LOI so it was pretty good.